This photograph was captured at a private estate in Rancho Palos Verdes, California. This was at the home of a friend of the bride and groom. The wedding colors were red and blue and all of the guests were provided with their own handfuls of confetti. After the wedding ceremony, I stood on a ladder counted down from three, and directed the wedding guests to throw the confetti into the air all at one time. This photo was the result. And to be honest, it's perhaps my favorite group wedding photo of all time. As you can see from the image, there were only about 30 guests at this wedding which to me made this image even more special. 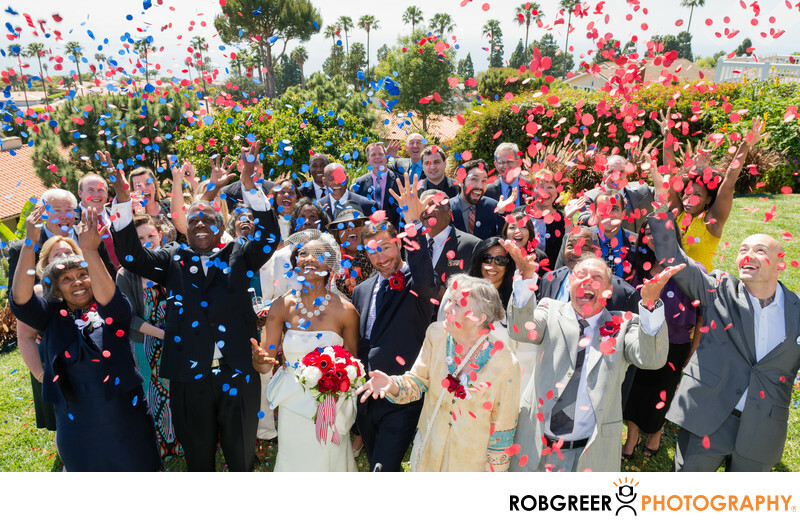 Even though many the faces in this image are obscured by the confetti, it really doesn't matter since the joy of the moment and the celebration following the ceremony are the story. That being said, I did capture a "clean" photo of this group before they through the confetti — I just preferred this one more than the other image. Location: Rancho Palos Verdes, California. 1/250; f/8.0; ISO 400; 24.0 mm.